Can you help our friends at Number One Mortgages raise £1000 for charity? Our friends (our next-door neighbours) Number One Mortgages of Shoreham-by-Sea, along with colleagues from our Shoreham office, have set themselves a target of raising £1000 for The PBC Foundation. 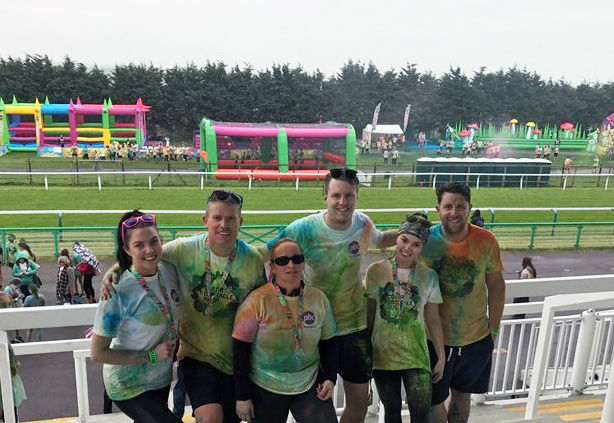 The 6-strong team took part in Brighton’s 5k obstacle colour run and fought their way through over 20 inflatable obstacles, slides, powder bombs and other fun distractions on 12th May at the event at Brighton Racecourse. It took the team around 30 minutes to complete the course, without too much calamity but they did get covered in colour! What is the Brighton Colour Run? The “Color Obstacle Rush Brighton” takes place every year. The run is for fun and does not stipulate that entrants need to raise money for charity – however the Number One Mortgages team saw the event as a great opportunity for getting sponsorship for getting very, very, messy! The team were joined by hundreds of other good sports to see who could escape with the cleanest t-shirt. The team chose The PBC Foundation as one of their team member’s family member suffers from the autoimmune condition Primary Biliary Cholangitis (PBC), which affects the liver. The charity supports those affected by the illness by offering a 24-hour helpline for patients and their families looking for advice, guidance and support in coping with the illness and seeking relevant therapies and services. The PBC Foundation also hosts regular social meetings and have a National Volunteer network. Funds donated will help raise awareness of the foundation, helping them to reach even more of those affected by PBC. The Number One Mortgages team have set up a Just Giving page to collect any donations to the charity. They are currently sitting at 68% of their target with just a week or so to go so would be very grateful for any small online donations to help them hit the target.